Ahead of a historic first appearance in the Mac Larnon Cup final on Monday against Downpatrick school, St. Patrick’s Grammar, MICHAEL WILSON sat down with three of the Cathair Dhoire management team - Paul Simpson, Conal Donaghy and Michael McCullagh - to talk about the first year of the project, the final and the ambitions, successes and potential of the Derry City schools amalgamation. How important for the future of the Cathair Dhoire project was this year being seen as success? Michael McCullagh (M McC): First, the results so far have illustrated that we pitched at the right level. There was chat about going to Mac Rory but the Mac Larnon is the right level at the moment. We had a three point victory in the semi-final, were defeated once in the group and won a couple of very tight games. As regards the final itself, that won’t determine whether the amalgamation continues or not. It’s really about exposing these players to a higher level of football and, in that respect, it’s already been a success. Getting them out for the final in front of such a large crowd is just an added bonus. When you all first sat down, you said Cathair Dhoire was about more than trophies so how will you gauge whether it has been successful? Conal Donaghy (CD): Getting to the final wasn’t really what we set out to achieve. We wanted the players to be competing at a level that was above the level they have been able to with their own schools. These boys have now shown that they can compete at Mac Larnon level and that’s how we judge the success. Some may go on to county, some may not but they will all go back to their clubs and help develop clubs within the city area and, really, that was the aim to start with. We wanted to develop the players and then use them to help develop the GAA within the city. How does the dynamics of the management team work? Paul Simpson (PS): Well, it’s three teachers and a fool! (laughs). No, it is a very different dynamic. CD: It’s different from a situation where you are seeing each other every day. You have to make time for it because it’s an extra commitment on top of the training session but we knew what we were getting into at the start. It’s Mac Larnon level football and this is the commitment level it takes. How do you find those demands because Cathair Dhoire involves a level of management that few of your competitors have? M McC: We’ve had to find our feet because we still have our own individual schools to look after. 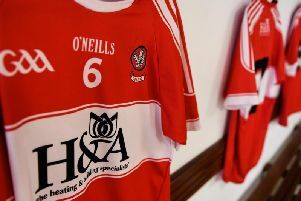 Lumen reached the quarter-finals of the O’Doherty Cup which meant we were playing football until February. St. Columb’s won the Markey Cup which meant they have been playing right through until March, so you have to balance things. What we do have from the four managers is a dedication to Cathair Dhoire. If we didn’t have that, then this would not work, no matter how talented a squad you had. We’ve met plenty of obstacles but we have managed to find our way around them and that’s only down to the commitment. Have you found that representing Cathair Dhoire has become something students at the various schools are now aiming for? PS: Definitely. I had a Year 8 session the other day and the boys in Lumen were talking about the Cathair Dhoire team and knew the team had a big final coming up. It has become aspirational for those lads. They now have a real awareness that what they are doing now in terms of training etc could lead to this. In terms of the stuff we are doing further down the schools, or even with primary schools, it’s great young players can now see lads they know playing where traditionally it was only schools further down the county. They can see a pathway and that’s really what this is about. This is not a ‘one team’ thing. We now have something that should give boys a better understanding that growing up and playing football with your schools can lead to this. There are undoubtedly challenges. We had the majority of our squad playing in an All Ireland semi-final before we play Mac Larnon and that won’t happen in any other school we are playing. M McC: For Paul, he has been involved with coaching throughout the city schools for quite a while now and I think he can see the fruition of that. We have often talked during this run about the number of players that have come through the Tower Cup, for example, so it must be rewarding for Paul and those working within the city GAA to see what their work is bringing. At the end of the day, we could go back to our own schools and manage those but this is about developing players for the future. Amalgamations can be contentious and there have been critics. Can you understand their point of view? CD: Amalgamations have been there for a while. Inishowen have been doing it for a long time and I think doing it really, really well because they’ve always focused on developing the players which you can see by the number of their players going on to county minor teams where they wouldn’t have been before. That’s their success. They haven’t won the Mac Larnon Cup. They are aiming to but they don’t see the success of their programme as being winning Mac Larnon Cups. With other schools, there has been some noise but we are focused on developing players. The trophy is not the prize for us. It is a bonus, of course, because every team goes out to win the match in front of it. Our next match is a final and we’re going out to win it, so are Downpatrick, and it should be a clinker of a game. However, it’s through the players’ development - and it will be only in the next few years when we hope to see them push on - that’s when we will know if it has really been a success. Is the aim eventually to see Derry City kids playing at Mac Rory level again? PS: Absolutely but the big challenge for us is access to the players on two fronts. First, it is ‘A’ level year for most and adding another layer of football on top of a layer of football on top of their ‘A’ levels - that’s a huge challenge. We would love to be in a position to train more than once a week. We only train on a Wednesday afternoon because of access to the players. That mightn’t be the case if all the players were at the same school. It would be a pipe dream for us to do an early morning session for example, it’s just not feasible but I’m sure almost every team we’ve played is able to do things like that. In terms of Mac Rory, there would be Mac Rory teams training four, five, six times a week so that would be a real challenge if we were looking at it from a purely coaching perspective. It’s nearly impossible to do what we’ve done based on one get-together a week but it’s thanks to the work being done in the three schools. Have you noticed a development with your own individual school teams? CD: The players are getting access to a wider range of players, playing at their level. At Oakgrove we have always had some really good players but it can be very difficult to them playing at the level they need to be because the team wouldn’t necessarily be as strong as they are. In the past we have played in the Markey Cup with players like Neil Forester and Stephen Ferguson, lads who were really strong. You enter them in the Markey Cup because that’s all there was for them and they carried the team as far as they could but you knew the team wasn’t strong enough. Catahir Dhoire gives players of that standard a chance to play in a team of that standard and that brings them on. Has the success of the team surprised you this year? CD: We set out at the start to qualify for the knock-out stages, that was our target and then you just see where it takes you. We can’t say we set out to win it. We set out to see what would happen and then, as the season developed, we saw the potential in our team. So, you’re having to rely on a bunch of players who don’t necessarily know each other to come together as a unit? PS: We are but extra games have helped gel the team. It’s not as if we sat down and said, ‘Right, we need to be doing something St. Patrick’s weekend!’ As the competition has gone on we have progressed toward becoming a team. From a coaching perspective I would be greedy. I’m always looking for a second session, a third session, maybe doing a video session but I’ve had to realise we just don’t have that access. What we are forced to do is look at video clips, email them around the management group, select a few pieces for players and send that information out. We are doing quite a bit over the Internet. There are some players who would be used to that, guys like Ben or Fergal (Mortimer) who are with county squads, but it’s very new to most and hopefully that can help them progress. There’s a lot of concern over coaching young players but you sound like you’re at the opposite end of the spectrum where players receive clear but minimal instruction with faith being placed in the individual’s talent and judgement. Is that fair? M McC: We don’t complicate things. It is a simple game-plan. We work on kick-outs and stuff but it’s about the basics of football and letting these boys enjoy their football at school. If you saw the recent game between St. Pat’s Maghera and the Abbey which drew all the criticism, that’s the opposite to what we’re trying to do. We are trying to develop players. Just going back to what Paul said, I remember our very first meeting at the College and I was so naive. I was saying things like, ‘We need to get strength and conditioning’, ‘We need to get out three or four times a week’ etc because I went through St. Pat’s, Maghera and when you are playing Mac Rory football, this is what you do. I quickly realised that was not going to happen. I realised it would be once, maybe twice, a week at best and organise a friendly here or there. Was it hard to get the players to gel with so little contact time? M McC: In fairness, a lot of the players knew each other even before we got them through the various clubs in the city. PS: With any group, if you are taking players from seven different clubs you’ve a big challenge. Now, because of the schools system in Derry, there has traditionally been club players from loads of different clubs coming to the likes of Lumen and St. Columb’s so that helped and Oakgrove was the same. That doesn’t happen in other schools where the majority of players come from one, two or maybe three clubs. We are doubling that. 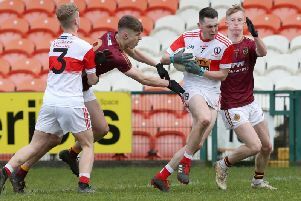 There would be loads of county players going to schools like St. Pat’s Maghera and I know, some people have focused on the county players we have but we will judge ourselves on how the players who are not at that standard have progress. Looking ahead to the final, what do you know of St Patrick’s? CD: We are just worrying about ourselves. We have seen their results obviously but we have to set our team out the way that suits us best. If we need to tweak things on the day to look after something they are doing, then fine, we’ll do that but we will approach it in the same manner we did all the other games. How has the new experience of preparing for a ‘St Patrick’s Day’ final been? CD: We (Oak Grove) played in county finals in the old vocational schools era and that was a big deal but this is a step up. Our sixth form have played at Markey Cup but having lads preparing for Mac Larnon final is a big deal for them and something for them to remember. Even if we don’t win, they’ll still have the memories of this final and boys remember their schools’ football. Neil Forester left Oakgrove 10 years ago but I met him recently and he talked about a Markey Cup game we played in Owenbeg against Holy Trinity, Cookstown as being one of his fondest memories. Neil has gone on to achieve a lot in the game but that’s still one of his biggest memories. This is a big deal for players and you see the excitement when you meet the boys in the corridor. All the chat is about football. What has Cathair Dhoire done for the profile of the GAA within your schools? CD: There is more talk than there normally would be. There is competition from other sports in our schools but Cathair Dhoire has raised the awareness of what is happening within Derry City GAA. PS: Particularly for the likes of St. Columb’s. Every year, St. Columb’s are going to be in a soccer final at some grade. That is reflective of the quality of players that are coming into the school. It is replicated in St. Colman’s or St. Pat’s Maghera for example where the quality players those schools have coming in are playing Gaelic football. That is the challenge for St. Columb’s and for us. In terms of profile, there are a lot of people talking about the team who have never talked about Gaelic football and that can only be good. As much as development is key, it would be nice to have a Mac Larnon Cup win on the CV? PS: Well, any one I have every talked to who won the Mac Larnon Cup remembers it as well as well as anyone who won a Mac Rory. Barry O’Hagan, whom I work with in the Council, has three Mac Larnon medals and he describes it as an outstanding time in his playing career. It’s something that sticks with you for life. I didn’t win much at school, well much of note (laughs) but anything I did win I can remember the game and the feeling when the final whistle blew, that’s what we are trying to create here. Is Cathair Dhoire about trying to create a legacy for the city? PS: Absolutely. Hopefully the success of one batch of players translates to the next and so on. It won’t work unless that happens the way it happens in other schools. It just so happens we’ve have to amalgamate to go to this level. As Conal said earlier, Mac Rory would be our aspiration but I don’t think it would be right to say ‘you are going to Mac Rory just because you are an amalgamation’. That’s unfair. We could go in, lose heavily in the group and it would have the opposite effect. M McC: That true, particularly in the first year. There’s too much at risk and when you do through our previous results, you quickly realise that Cathair Dhoire has to be at Mac Larnon level. The College are playing ‘C’ level in the Markey Cup and they are providing the majority of the players. They are at the right level as showed in their results so I think we are at the right level with ‘B’ football this year. It was important to get this right in the first year. No one is saying we won’t eventually go to Mac Rory. We certainly hope to, but we have to recognise how tough that is. That said, this year’s success has given us something to think about.